Gummy candies, aside from being colorful and fun, are one of those snacks with limitless potential. They come in different colors and forms like gummy colas, gummy bears, and gummy worms which are some of the most popular ones. But as time goes by, it seems like the forms of gummy candies being created are becoming more strange and weird. There are those which are shocking, and those which are just kind of gross. If you’re looking into trying out some of the unusual gummy candies and snacks out there, here are some that you can add to your list. Gummy worms are popular, but how about gummy maggots? If you look at them long enough, you can almost see them squirm. If you’re planning for a disgusting way to gross out your coworkers and family, these tasty and colorful jelly sweets can do the trick. How about eating brains for snack? These jelly filled gummy brains are really weird to be eaten, but they are delicious as well. They can also be one of the perfect treats you can give to kids on Halloween. This is a fish-shaped gummy candy that kids and adults will love. And even though they are fish-shaped, they taste like fruit and not like fish. They are red, chewy, and delicious gummy candies. If you’re a fan of horror and gruesome films and shows, then you might probably like to taste these gummy eyeballs as well. Or maybe challenge a friend to eat one if they can. These gummy chicken feet are indeed very unusual. Who would’ve thought that someone would come up with making gummy candies in the shape of chicken feet? But it sure looks good and they come in fruity flavors. A lot of people are afraid of mice, that’s why it’s also weird to eat snacks that are shaped like them. But no matter how unusual that may seem, Haribo still made that possible by coming up with their sweet mice gummy candy. It comes in fresh and fruity flavors of juicy orange and raspberry. Fried eggs are not just for breakfast because they can also be fun snacks in the form of gummy candies. 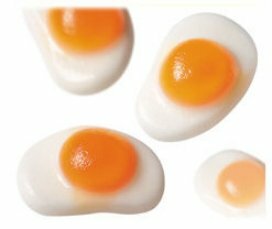 These are cute little fried egg gummies that children and as well as adults will love. What’s cool about them is they are very detailed just like how real fried eggs look like. These are fries-shaped sour gummy candies that comes in different flavors such as grapefruit, pineapple, peach, orange, and lemon. These are fun and colorful gummy treats that is perfect for all young and old fruit gums lovers. If you want to really gross out your friends and family, try giving them a box of this gummy boogers candy. Gummy candies are yummy but we’re not sure if you will be able to eat these with the way they look. This is certainly not your regular gummy. This gummy snack is made with lots of efforts because it looks like a real spaghetti meal. It is made with strawberry banana noodles, cherry sauce, and fruity meatballs. Unusual but cool, isn’t it? Gummy worms are no longer unusual these days, but a large one might be. This gummy worm, believe it or not, is 125 times larger and better compared to the average gummy worm. It comes in 23 x 2.0 inches and is approximately 3 pounds. In fact, you will be able to get a whopping 51 servings of mouthwatering sweetness with the world’s largest gummy worm. Another weird animal turned into a delicious gummy treat is a gecko. They come in different color combinations which are in different sour flavors as well. Geckos can be scary but these gummy treats are somehow cute and adorable. If there’s a gummy spaghetti meal, there’s also a gummy sushi meal. It’s unusual but how this gummy meal is done is amazing as well. Its colors and shape resembles a real sushi meal. In fact, you might mistakenly dip it in soy sauce and wasabi if you’re not informed that they are gummy candies. It is a combination of 8 delicious fruity flavors. These gummy nachos are complete with gummy chips topped with gummy meat, gummy olives, gummy jalapeños, gummy cheese, and a gummy hot pepper. Each of the ingredients come in delicious fruity flavors such as grape, green apple, banana, and cherry. This is a hefty hunk of watermelon slice gummy on a stick. Aside from looking like a real watermelon, it also has an unbelievably authentic watermelon taste. This unusual gummy treat weighs over a pound, making it a crazy one of a kind gummy. These are some of the unusual gummy candies and snacks that you might want to try. Gummy candies are indeed versatile snacks because they can be shaped into different shapes and forms depending on what you want. So, which of these unusual gummy candies would you like to try soon?